iOS 7 was one of the most awaited major overhaul for iOS, since its launch, a couple of years back. And the latest iOS 8 update, which was unveiled at WWDC 2014, can be termed as the perfect update to the iOS 7 operating system. The iOS 8 operating system brings in a set of new features that we have been waiting to come on iOS, for the longest time now. And there is no apparent doubt that, with the introduction of the iOS 8 operating system, Apple will be able to satisfy a majority of the iOS users and even pursue others to opt iOS as well. Every major iOS application has seen some improvements and addition of features. And the Photos app has also received a few feature upgrades as well, which includes a new set of editing tools, smart search functionality on the basis of time/date/location or album name, iCloud Photo Library sync, support for third party editing and filter tools and so on. However, a somewhat new feature in the Photos app, has been making quite a talk for some days now. And it is the ability to hide photos from the Photos app on your Apple iPad or iPhone in iOS 8. Well, in fact it does not hide the selected photos completely from the Photos app, however, makes it hard to find though. Well, if you have already installed the iOS 8 on your Apple iPhone or iPad, and if you have not come across this feature yet, and if you are interested in hiding Photos from the Photos App on your Apple iPad or iPhone, then today we are here with a detailed tutorial on how to do the same. First of all, navigate to the Photos from your Apple iPad or iPhone running the iOS 8 operating system. Select the photo that you wish to hide from the Album. From the Photos app, tap and hold for a few seconds on the Photo that you wish to hide. From the pop up menu that appears at the bottom of the screen, select the “Hide Photo” option. Well, you must now be happy that we now can hide photos from the Photos app on Apple devices running iOS 8. However, there is a catch. 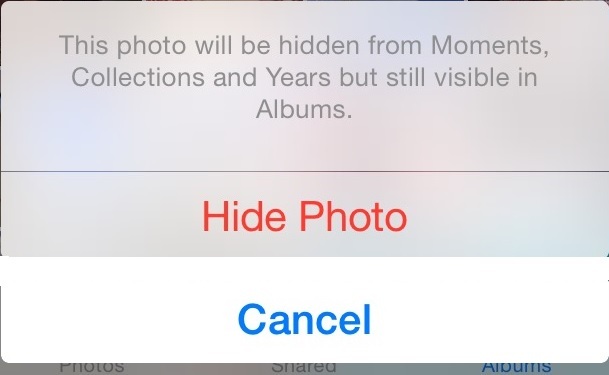 The photos you select to hide from the Photos App, using the above method, will only be hidden from sections such as Moments, Collections, Years etc., however, will remain seen on the main album. Also, if the image that you wish to hide from the Photos app has already been added to an album before, you will not be able to hide it using the “Hide Photo” option on iOS 8, which might be a major let down to many. Well, the feature has just been discovered, and the final iOS 8 version is not yet out as well. Therefore, we may see a more functional option to hide Photos in the official release in the future. If you weren’t able to use the new OS version on your device because of the iOS 8 activation error, check the article to see how you could fix it.